We are at the age where we have to make a decision about something very important to our family. It came up last year in a way that I hadn't anticipated. And this year, decisions must be made. We have to have a solid front, Jeff and I. There can't be any wishy-washy, undecided, play it by ear kind of thinking. Santa Claus or St. Nicholas? Last year, we talked about Santa. We saw him one time- at Jeff's company Christmas party. Teagan decided that all she wanted from Santa was a "big, big, big, big pillow and a big, big, big, big blanket." So Santa brought her a comforter for her bed and a king size pillow. But here is what I never imagined would be a child's reaction to the Santa story. It's Christmas Eve. For weeks, we've been singing songs and reading books about Santa and Christmas. Bedtime comes and I give the standard parent line "Go to sleep as fast as you can! Santa can't bring your presents unless you are sound asleep!" A look of panic passed by her little face. Her big blues eyes looked up at me and said "Mommy, I don't want Santa to come in our house." Oy. My logical and cautious daughter. Doesn't want a strange man to sneak into the house, doesn't like the idea that he's been watching her already. It is pretty creepy when you think about it from that perspective. I assured her that we could leave a note for Santa to just leave our presents on the front porch and we would bring them in that morning. Which we did. All of that is something of a distant memory for her. But it raised significant doubt about Santa Claus in my mind. I gave up on Santa when I was 5. Through a series of egg events, I determined, on my own, that the Easter Bunny was a sham. I went to my mom and confronted her. She told me that I was right- there wasn't really an Easter Bunny. I left the room. I come back and ask... "No Santa, either? And no tooth fairy?" We still had stockings and teeth left under pillows, of course. And as we get closer to the holiday, I will share the story of my most magical Christmas. I still very much believe in Christmas magic and miracles. I am leaning towards not pushing the "magic" of Santa Claus. I'm thinking, instead, teaching about Saint Nicholas and that the things he actually did are the things we celebrate by visiting with Santa and hanging stockings and so on. I've been researching websites and books on the subject. What I love about the idea is that it still allows plenty of stockings and gifts and sitting on Santa's lap. But it gives the legend some history, some explanation. Another way that I think about it is that I am already asking my children to stretch their imaginations when it comes to Christmas. I am asking them to believe that an angel came down from heaven and gave news to Mary and Joseph. That Mary got pregnant with God's baby. That she gave birth in a barn and that Jesus lay around in a feeding trough. That this was God's way of giving humanity His greatest gift- His son. That's a lot for a kid to take in when you think about it. But at the same time, I think of the time that Jeff dressed up as Santa for his company's Christmas party. This was before the party was hosted at the local country club- and the club requires that the company use their provided Santa. So Jeff had a huge advantage... he knew these kids and their parents. 2 little boys, probably around ages 7 or 8, kept hanging around Jeff's "throne" by the tree. Kept asking him questions, trying to determine if he was real or not. He passed every test and then he blew their minds when he mentioned each boys' father by name and said that he still remembers bringing presents to their dads when they were little. You should have seen their eyes get HUGE! And then I flip flop again. We were strengthening lies to these boys... but at the same time, we were giving them an inkling of Christmas magic, I think. Because when they are adults and they are looking back, they will still have to kind of scratch their heads and wonder how that Santa knew the things he knew. 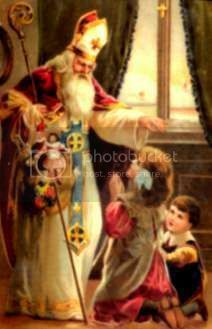 Saint Nicholas was a boy when his parents died. They left him a lot of money so he was a wealthy young man. Many of his friends were poor. So he would secretly sneak and drop bags of money or needed items in their homes in the dark of night. It is because of his secret, anonymous giving that the legend of Santa Claus was born. That is something I really like about focusing on Saint Nicholas. It really lends itself to the focus on charity, on compassion. Santa tends to feel more commercial. Santa tends to be about what I want. Saint Nicholas feels like more about what others need. Teaching my children charity and compassion is a main priority in my parenting goals. So do I lead with Saint Nicholas and bridge that to the legend of Santa? Or do I go with the masses and fill their heads with tales of a fat guy in a red suit who flies around in a sleigh with magic reindeer and gives presents to every boy and girl in the whole world in one night? I'm gearing up for the holiday season. Be prepared for blogging about trips to the Children's Museum, the Zoo, and other holiday adventures. And also watch for entries about the charitable things that we do this season. 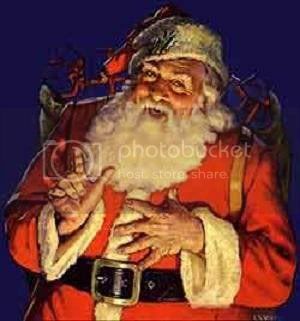 So leave me your memories of Santa Claus... your opinions on Saint Nicholas vs Santa Claus, how you handled it with your kids, how you handled the discovery that he isn't "real," and share if you've done something different altogether. Also share your favorite holiday compassion projects. are you fostering other magical beliefs? fairies, gnomes, easter bunny? I treasure my own childhood's fantasies. and I can't imagine awakening my girls consciousness to adult "reality" so early. but, that's us. if you are in doubt, I'd go with st. nick, but allow him to be a little more santa-y while they are little. Once again I see how brilliant you really are! I have hardly mentioned Santa in my house because I'm not really a fan of the lying to my kids thing. Eben called him "Christmas Man" last year, somehow gathering info in him when I had told him nothing of Santa. St. Nick is a GREAT idea! I think we will do that in our family. Thank you!!!! Incidently, and you may already know this, Klaus (pronounced to rhyme with house) is short for Nicholas in German.....if you're looking for an extra Santa tie in. We've gone the Santa route but the Easter Bunny and tooth fairy have always been clearly understood to be Mum and/or Dad. My youngest (7 yrs) was told recently that Santa is also Mum and Dad (thank you big brother with a big mouth) but I think he's still in denial and is proceeding as if Santa were real. I have very fond memories of the childhood ritual of waiting for Santa to arrive but I can't actually remember really, truly believing in him and therefore wasn't particularly worried about the whole issue. There didn't appear to be any trauma associated with finding out that Santa wasn't real, more a kind of smug satisfaction at having worked it out. David was 6 1/2 when he quite calmly said to me "Santa is you and Dad isn't he?" and I said "Yep, just like the Easter Bunny, don't tell your sister." Thirty seconds later 5 year old Caitlin appears and says "David says Santa is you!" I conceded the truth of this and that was that. I swore them both to secrecy to let Tom have a few years of Santa fun. My brother and sister have both married into Dutch families so we've had exposure to Sinterklaas from early on too. I'm planning on making a point over the next year of talking about the seasonal celebrations of lots of different cultures, mostly because it's fun and interesting. We talk a lot about the different things that different people believe. My Christmas charity of choice is the Salvation Army Christmas Appeal, we make a point of going to one of their collection points at the mall and the kids put money in the bucket. We also contribute gifts to a giving tree each year, usually through the kids' school. Hubby gets dressed up as Santa at our Christmas party each year and gives out a small gift to every kid there, much hilarity surrounds the fact that every.single.year Adam is off doing something else and misses out on meeting Santa.